Son of Glaucus and grandson of Sisyphus, the king and founder of the city of Corinth, the hero was actually called Ipponoo and assumed the name of Bellerophon after he inadvertently killed Bellero. On this point, however, the classical sources are not definitive. According to some, Bellero was the despot of Corinth, according to others, he was the ruler of Syracuse, and according to still more, Bellerophon would not have killed him, but rather his brother, Deliade. However, all sources agree that, as a result of a crime committed involuntarily, Bellerophon had to leave his hometown and came to the city of Tiryns, where he was a guest of the king, Proitos. The king’s wife, Stheneboia, fell in love with him, but when the hero rejected her advances, she accused him, to her husband, of trying to seduce her. Proitos, to which the laws of hospitality forbade killing Bellerophon, sent him to his father in law, Iobates king of Lycia, under the pretext of delivering a message. In fact, in the letter, Proitos asked to his father in law to kill the young man. However, even Iobates felt bound by the laws of hospitality. 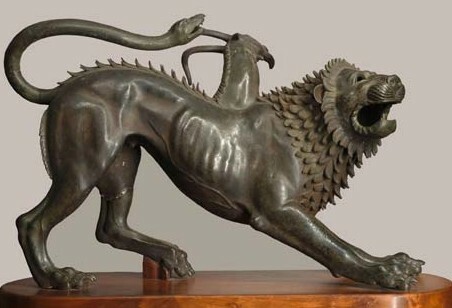 So, instead of killing him directly, he decided to send him against the Chimera, a monster spitting fire who was terrorizing his kingdom, whose body was composed of the parts of three animals.. 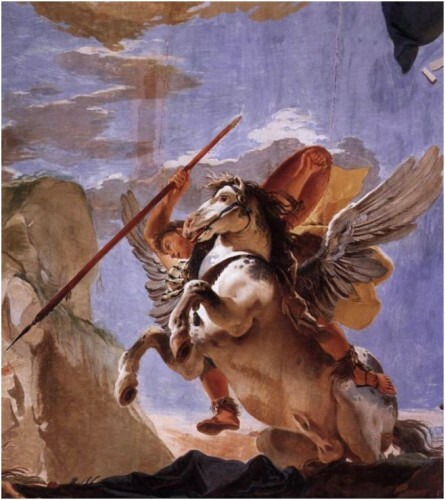 According to the majority of the sources, excluding Homer, Bellerophon faced the combat riding Pegasus. Thanks to the speed of his horse, he was then able to avoid the attacks of the monster and then to kill her with a trick. On the tip of his lance, the hero put a piece of lead, which was melted by the flames that sprang from the jaws of the Chimera. Bellerophon then poured the molten metal into the creature’s throat, suffocating her. Iobates then asked him to face the barbarous tribe of the Solymoi, followed by the Amazons. In both of these challenges, Pegasus contributed significantly to the victory of the hero. At this point, however, Iobates recognized the virtue and courage of Bellerophon. He revealed the request from Proitos and, as a sign of his esteem and friendship, he gave Bellerophon his daughter in marriage, sharing with him the kingdom. The last part of the life of Bellerophon, however, was unhappy. Homer says that when the gods conceived a strong aversion toward him, he began to wander the plain of Alea, avoiding meeting other men. According to other sources, Bellerophon would be filled with pride for his achievements and aspired to challenge the gods. For this reason, Zeus sent a gadfly to harass the winged horse who, annoyed by his bite, finally unseated his rider. The figures of Bellerophon and Pegasus are linked to the god Poseidon. In his Theogony, Hesiod claims that the winged horse originated from the neck of Medusa at the time when she was decapitated by Perseus with a scythe. Actually, Medusa had previously mated with the god Poseidon who took the form of a horse. Immediately after her death, the winged horse was raised to the heavenly abode of the gods, where he took on the task of bringing the lightning to Zeus. 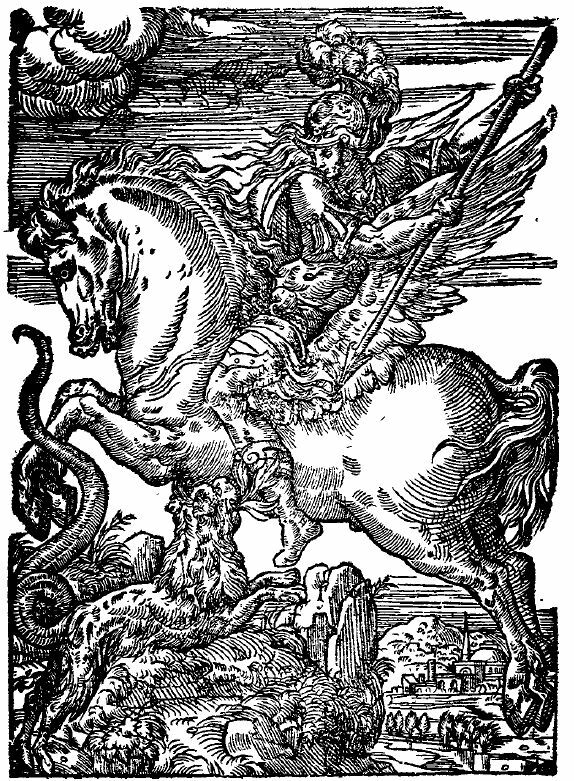 Also according to Hesiod, as well as Hyginus, the same Bellerophon was the son of Poseidon. The struggle that opposed them against the Chimera proposes the theme of the fight between a heavenly knight and a hellish monster, which already occurred in the religions of Asia Minor and was then transposed in the Christian legend of St. George slaying the dragon. 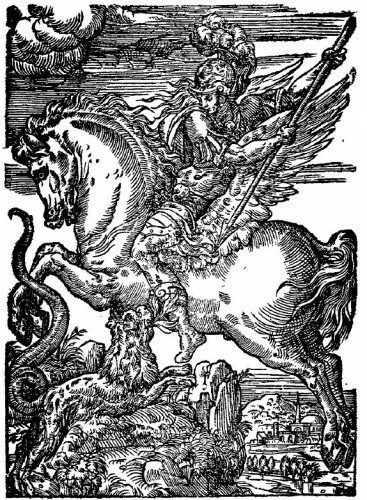 Having been able to reduce to obedience Pegasus, the terrible winged horse born from the blood of Medusa, Bellerophon especially fascinated the Renaissance authors of treatises about horsemanship. very fascinating! Pegasus the wing-horse, and Bellerophon the tragic hero. Close to Alea [part of Tegea from the name of the king Tegea son of Lycaon] is ancient Palladium , from where came the first Arcadians colonists to the ”Pallatinum” hill of Rome! This is a nice ride betwen apple orchards and hapens to be my land of origin!